Spring is fast approaching: aka the perfect time to plant your bulbs and dig out your dusty BBQ. Longer days will soon push back sundown and lead to lazy evenings spent relaxing with loved ones outside. The best place to do this is in your very own garden. But if you’re looking at it right now thinking it looks far from a peaceful haven, fear not! We’re here to help you trim, spruce and prune until you’re longing for humid summer evenings perfect for sitting al fresco with a chilled glass of wine. 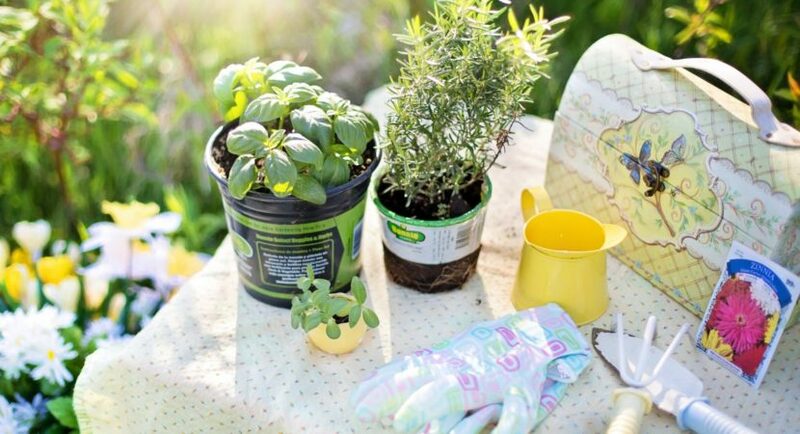 Here’s how to jazz up your neglected garden in time for the joys of spring. First thing’s first: mow that lawn. Grab your hedge trimmers and give your bushes a well-needed haircut. Pull dead heads off abandoned flowers and damaged branches from trees. After a few hour’s work you should be able to envision its springtime potential. If you long for a pruned lawn but simply don’t have time to tackle it, enlist the help of a local gardener (or your children in exchange for pocket money!). Now, unearth forgotten flower beds and vegetable patches; clearing weeds, debris and topsoil away until it’s the perfect place to plant new bulbs. Sow your springtime seeds – daffodils, bluebells, crocuses – and wait for their pretty heads to pop up. To make the most of your outdoor space, it needs furnishing just as much as the interior of your house. Here are a few ideas for comfy, cozy garden furnishings that will have you ditching the lounge for the great outdoors. Lights: lanterns, standing outdoor lamps, fairy lights or strings of bulbs look amazing at dusk and light up the area so you can stay outside for longer. Contact an electrician, like those at richtekelectrical.com.au based in Perth if you are local to the city, for safe installation of outdoor lighting. An alternative to this is to use solar lighting, which makes its own energy and recharges in the sun. Wicker furniture: benches, tables, and armchairs look chic and homely crafted from wicker. Treat the material with anti-fungus coating to ensure it stays durable and strong in all weather. Loveseat: a swinging loveseat is perfect for romantic evenings with a glass of wine. Summer house: stay sheltered from hot midday sun by building or buying your very own summer house. Furnish with a table and chairs, place a radio in there, and enjoy the outdoors in a relaxing nook away from the chaos of your main home. It can also act as a storage area for your garden furniture when summer resides. Plant pots: if you don’t have green fingers, try planting flowers and shrubbery into large pots rather than straight into the ground, where they are easier to tend to and won’t take over your whole garden! Outdoor heater: if you live in a cool climate but still want to enjoy the outdoors this summer, get an outdoor heating system. Attach to the roof overhanging a patio or paved area so you can sit underneath and bask in warmth when chilly evenings come around. Log burner: alternatively, buy a free-standing log burner to warm up when night falls. These are shabby-chic, easy on the eye and better for the environment. Water feature: love the relaxing sound of a bubbling brook? Replicate this in the comfort of your own garden by installing a water feature or dig out a pond to fill with fish. Now to add the finishing touches. Grab your paintbrush and paint the fences; build a garden seat from old wooden pallets (lots of garden stores will give these away for free); blow up the paddling pool; enlist the kids to help you construct a frame for climbing plants. After all this is done, you should be able to relax on your new garden sofa or swinging chair, looking out at your rainbow flower bed and freshly trimmed lawn, enjoying a morning coffee or evening glass of wine. We hope these tips have been useful for getting your garden prepared for springtime soirees and summer BBQs!